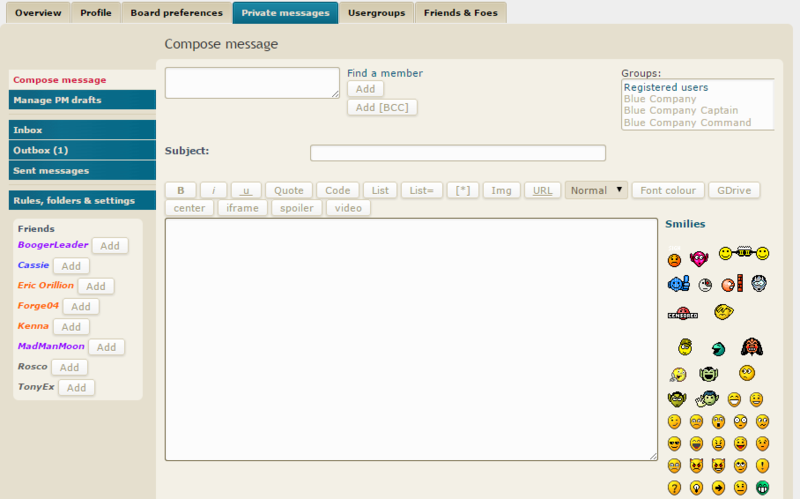 don,t like that i have to sign in to arc to even use forums or even post. Don't care for the vannila fourms they are a mess in genreal. if i try to sign in out side of arc i just get a loop to the frist pages or if i try to do anything. worse move yet for fourms of any game company. i see it as a way to drive player form even using them. you have lost the stablity of the system you have to settle for less capable system. ...much more Carribean/Ocean/teal blues, but I imagine still contributes to #1. perhaps I need to work on a nice soothing amber theme. Oh my goodness, please, no to that blue theme. I think we are fine with what we have, or a fine-tuned variant of it. Please keep the dark theme. That blue Eldarth suggested is just as bad as black text on white backgrounds to me. And I really hate the animated signatures. There are decent ways to animate signatures but there are also many more obnoxious ways. I would rather moderate them on a case by case basis but if the option is between none and the nonsense some people force us to deal with I would rather have none at all. Seconded. That is NOT cool. Undo immediately. ...while we wait the months (or years or never) for PWE's "update." You don't know what blue light is, do you? I'll tell you right now that what you think it is, it is not. Yeah, I was wondering the same thing when I saw that post. I was thinking it was all fluorescent light/LED light, to include all computer, phone, and tablet screens. Which, BTW, will also play havoc with your sleeping patterns. Edit: A number of people have complained that there are numerous issues with the embedded iframe. So why was it forced? Yeah, I've had that problem as well. I think the redirects as a whole need to be addressed, since as mentioned above, the forced ARC redirect while IN the forums breaks several features. Could those be addressed together? I've already explained the problems with the embedded iframe multiple times. Can we not have 3 notifications per PM. Quite irritating. Just show us a notification at the inbox icon rather than next to our user name and notification list as well. DEV TRACKER a must and RECENT POST\TODAYS POSTS section to quickly view all recent posts from all sub-forums for STO. These were both features of the old forums and without them the forums are basically useless. These should be top priority over all other things especially all the cosmetic complaints. NO! No auto redirect to your horrible embedded forums! Stop that. Can't delete notifications in the forum account settings. I was able to at first but it changed. Now I have pages and pages of notifications from threads I've posted in. I get one every time someone posts in those threads. And I don't have any threads bookmarked. Trendy I love all the work you have done and am very grateful for all the work you and the team are continuing to do. I'm going to give an ongoing list of updates I would like to see... be nice to me. This was up before the Forums Suggestion Section returned... Move if you must. PM Subjects, would be nice! Don't know how possible this is, but on our forums we can designate friends and foes, which put them in a short list for sending pms, so we don't have to search for the name..
On the Main Category Page we had the option to choose between seeing all Categories and "Subscribed" categories, this is gone now and we need it back. Right now I cannot Access forums I have hidden. Without a Workaround, that has to then be disabled after use. Its a long proccess. When I view the Star Trek Online Forums, and it include 5 Main Category Headers, I would like a List of all the Sub-forums and the Post counts and so forth, I am not a fan of have to go 3 Category folders Deep before getting to the bug section. Not sure how doable this is, but it is something i would like to see if possible. Like the way they used to look once in the STO section, Just layout wise. Tapatalk is a 3rd Party Mobile Application that is used by many STO Fleets as a way to better view forums. It provides an easy to use interface for browsing and Modding forums on your mobile devices. It is also free to use for both the forum owner and forum user. Dev Tracker is on the to-do list as stated in the first post. Recent Posts is as simple as hiding all non-STO forums and clicking "discussions." TBH I have actually fopund navigating newer posts far easier on Vanilla than on VBulletin once I properly set it up. Now, I have resigned myself to using ARC window to access the Vanilla Forums because I have less issues logging in amd commenting this way. I understand everyone wants to use different browsers and access the forums in ways that work best for them....because I am doing the same thing. But there has to be some way to get links posted in a thread to work all in one browser window.....even if it is "embedded" in ARC. I am slightly concerned because there are a lot of changes happening on the test servers for STO I am trying to keep up with, and one can not read any posts in those Test Server folders when not signed in. Oh and additionallly: I tried to sign in via Chrome on my Chromebook laptop this afternoon. Of course, this triggers the ARC Defender. Well, this afternoon.... while trying to sign into ARC....it sent me 2 emails with 2 different pass codes...neither one of which worked. And I get the warning that I will only get 5 tries before they lock my account out. I decided to come to my main computer and sign in via ARC. There are a few bugs. I see some Raiderz posts for some reason. However if it is not working exactly as I stated it should be listed in a bug report. Citing which game forums are going through your filters would help the administators a lot. 1. As a STO player with a number of forum titles from the STO forums, I would like to see those make a return. Many of them required a pack purchase, so there was some real money involved in getting the title. 3. 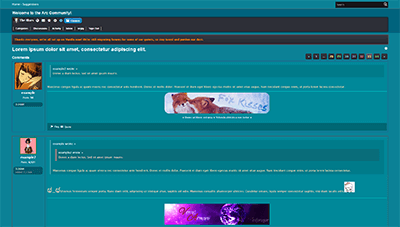 The user pages have never been great or all that self-explanatory, even in the old forums. I'd like to see a better layout for the user page for our personal pages (e.g. if we have multiple titles, a dedicated "Change your title" button). 4. The search function needs to be updated. I would like a way to search by user rather than key word. I would also like to be able to sort results based on different criteria (e.g. "Most Relevant" or "Most Recent"). 5. I'd like to see better tags for guides, etc. Right now they all read "Announcement" when they could be guides, stickied math/theorycrafting, or announcements. At the very least, I'd like to see a separate "Guide" tag for the many guides in some of the forums. I click on a notification and it takes me to the top of the page where that post is, so I then have to scroll down to find the post I came to read (and usually have to go back to the notifications page first to see which post it is based on the timestamp). I post and it takes me to the top of the page where that post is. I can't even bookmark my own posts now; there's no way to do it. If you want to "fix" something, make sure the "fix" doesn't break anything in the process. I want to bookmark my own posts (okay, maybe not all of them, but at least some), and that's a feature which forum users have come to expect, so I don't think I'm being remotely unreasonable, but you've made that impossible with your "it must have the 'Arc' name on it" policy. I don't care whose name is on it if it works right. If you can make it work right, I don't mind the frame. This almost certainly has nothing to do with the embedded iframe or the redirection. An admin has set the Tribble and Redshirt forums to be hidden unless the user is signed in. I have no idea why, because those forums were not restricted before the forum migration. Probably to Prevent, Posts regarding unreleased content from making its way into the Search engines and RSS Feeds. I wouldn't want Comments about unreleased content and any negative feedback about WIP versions, appearing in Google and driving down reviews. but thats just me. If it's a deliberate policy decision and not a bug, then they should say so. It doesn't make much sense as a policy decision anyway because people are posting the changes on Tribble to reddit and the visible forums. The information will get out one way or another. Be aware that the hiding of boards is a little, bizarre. If the Devs change the name of the board or it's position in the category listing then it becomes unhidden again on the discussion page even though it still shows to you as hidden on the main page. If you simply unhide and then rehide the board (or it's game board) it will no longer show up in the discussions page. I had this issue with a few boards from games I'd hidden and doing this resolved it. Now I only get posts about STO or from the ARC Forums boards in my discussions page.